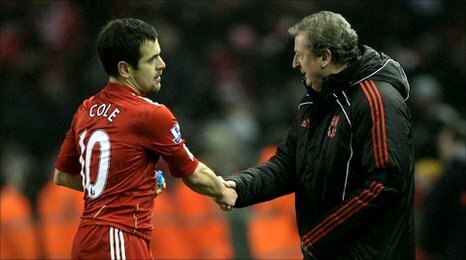 Joe Cole's late goal gives Liverpool the much needed win over Bolton at Anfield. Torres and Cole were the highlights of the day, as they were able to secure victory for Liverpool after facing two consecutive defeats. Bolton were able to secure 1-0 lead by 43rd minute as Davies was able to make room hence powering Taylor acress Reina, who could only see ball going past. Liverpool replied shortly after the break as Fernando Torres volleyed home a delightful chip from Steven Gerrard four minutes into the second half. Torres scored his first goal since November, 10. Cole was introduced on 82 minutes and claimed his first Premier League goal in stoppage time after Steven Gerrard's deep cross was touched back by Maxi Rodriguez, although replays suggested he was offside. Liverpool now stand ninth in the table and are well clear from the relegation zone while Bolton drop to seventh. Roy Hodgson has come under increased criticism after a home loss to relegation-threatened Wolverhampton in the last round, with British media reporting that the club's new owners are actively looking for a replacement.